EF-PLUS™ is a superior metal treatment that is designed to interact with the metal surfaces at a molecular level in your vehicles engine. It helps to decrease friction and protect your engine and its components. 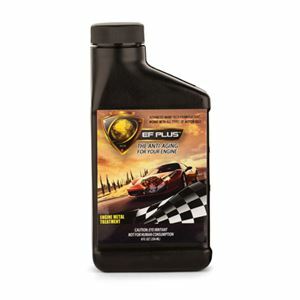 EF-PLUS™ is a synthetic oil additive that is ahead of the game when it comes to engine protection and anti-friction formulas. The proprietary formula designed with micro-molecules that are beyond the technology science is called nano. EF-PLUS™ is formulated with "smart molecules." These smart molecules know how to react to any combination of temperature and pressure. When the temperature, friction and pressure is altered up or down, EF-PLUS™ molecules activate a succession of chemical reactions and modify its' behavior according to the present condition and stress. The higher the pressure and the stress, the better it will perform. EF-PLUS™ formula contains 100% organic, mineral anti-friction compounds that never break down. It’s 100% safe for any of the engine components. It does not contain solids, nor will it reformulate the chemical components of your standard motor oil. It will blend perfectly with any of the motor oils (whether synthetic or conventional).